Extensor tendon injuries can be grouped into 2 large categories: 1) acute simple laceration and 2) complex extensor tendon laceration with associated features. Although the diagnosis and treatment of simple lacerations are usually straightforward, certain aspects critical to ensure the optimum outcome are discussed further below. A complex laceration includes associated injuries of surrounding structures or dysfunction that arises from the disruption of the tendon or surrounding structures (eg, mallet finger, boutonniere deformity, sagittal band disorder). 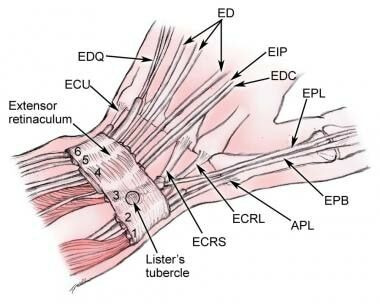 This article reviews the current understanding of diagnosis and treatment of the complete range of extensor tendon laceration issues. Anatomical and functional understanding of the extensor system was advanced significantly by Albinus, who first illustrated the basic structure in extensor tendon anatomy in 1734. Further progress of extensor tendon dynamics and balance forces concepts were made by Fowler in 1942. Landsmeer also contributed to the understanding of the extensor system's dynamic interplay with the oblique retinacular ligament in 1949. See Relevant Anatomy for a detailed discussion of anatomy. Extensor lacerations are accompanied by various degrees of skin injury, ranging from minimal (as in puncture wounds) to large avulsions, which can cause significant loss of domain of both elements. Because of the superficial location of the extensor tendons in the wrist and hand, the laceration often easily directly observed on physical examination with manipulation of the overlying skin. The underlying joint is passively flexed and extended for full visualization of the injury area. The most common condition wherein the tendon laceration is present outside the area of the skin laceration is the fight bite. In this situation, the metacarpophalangeal joint is flexed and makes contact with an opponent's teeth (see image below). The resultant extensor tendon laceration is located proximal to skin laceration when the hand is in resting position with the MP joints extended, which is the normal position of the hand, especially when being medically examined. In the acute setting, most extensor tendon lacerations exhibit some loss of extensor function, whether it is a decrease in active extension range of motion, decrease in extension strength, or complete loss of extension of affected joints. In the most straightforward case, the patient presents with one or more digits that stay more flexed than the others when the patient attempts to extend all fingers. This indicates a complete laceration of the extensor tendon on the affected digits. However, if all the extensors in the hand are completely lacerated, then the fingers stay flexed at rest or at attempt to straighten. Also, the position of the fingers does not change regardless of the position of the wrist; this indicates loss of the normal tenodesis effect. In less straightforward cases, a tendon laceration can be present on examination, but the degree of laceration or surrounding anatomy can hide an extension deficit. Up to 80% of the extensor tendon may be lacerated without loss of function, but the chance of delayed rupture is increased when the laceration includes more than 40% of the tendon. Therefore, the dorsal hand and wrist wound must be explored well when any suspicion of tendon injury exists. At the wrist, 3 dedicated wrist extensors (ECRL, ECRB, ECU) and the finger extensors aid in wrist extension. Therefore, a single wrist extensor laceration can be missed on an initial function examination; thus, careful direct examination must be performed. Finger extension tendon laceration also can be masked. The index and small fingers have 2 extensor tendons apiece (EDC-II and EIP for the index finger; EDC V and EDM for the small finger), and masking could be present if only one is lacerated. Also, extensor tendon laceration of the dorsal palm occurring proximal to juncturae tendineae may also mask extensor dysfunction. Juncturae tendineae are intertendinous fascia connections that attach diagonally between the tendons of the EDC. Extensor system of the hand. Note the juncturae tendineae that interconnect the extensor digitorum communis (EDC) tendons. The purpose of the juncturae is to coordinate the extensor motion of the digits. The interconnection of the juncturae allows continue extension of the affected digit if an extensor tendon laceration occurs proximal to the junctura. Understanding this anatomical subtlety avoids missing the diagnosis of an extensor tendon laceration. Debris is often present in these wounds, and particles need to be completely cleared for adequate healing, for prevention of infection, and to attain an unobstructed view of injured area. For open dirty wounds of the hand and wrist, after the full sensory examination is complete, local blockage of the extensor area should be performed. This allows adequate cleansing of the wounds without pain or muscle dysfunction, since the extensor muscle bellies and innervations lie much more proximal. After a thorough wound debridement, the direct extensor tendon examination and muscle function testing should be performed. As with most normal structures, significant disruption should be repaired when possible. Most lacerations of the extensor system should be repaired. However, certain lesser degree lacerations can do well without repair. A laceration of the extensor over the proximal phalanx involving 40% of tendon, in which the patient can extend the finger against resistance, do well with or without repair. Small partial extensor lacerations can sometimes demonstrate triggering but do not exhibit the delayed rupture exhibited by lacerations of >40% of the extensor tendon. The general principles and timing of management for extensor tendon injuries are similar to those for flexor tendon injuries. In combined repairs, flexor tendon rehabilitation must take priority. When deciding when and where to perform an extensor repair, one of the first questions to address is infection risk due to contamination of the wound. An extensor tendon laceration wound that is not infected or severely contaminated can be repaired immediately. Extensor tendon laceration wounds with significant debris contamination or high risk of future infection (eg, fight bites) must be taken to the operating room for a thorough debridement and washout before repair. The nature of this type of contamination requires optimal lighting, instruments, and surgical support uniquely found in the operating suite. At the completion of the debridement, the clinical decision must be made whether to directly repair the extensor tendon or delay the repair for a course of antibiotics and observation to avoid wound infection. As with all disorders of the hand, diagnosis and correct therapy application hinges on a thorough understanding of the relevant anatomy. [11, 12] The upper extremity contains 12 extensor tendons. These tendons comprise an extensor system that dorsally maneuvers the wrist, thumb, and all fingers. Extensor tendons also participate in the radial and ulnar deviation of the wrist and contribute to the supination and pronation of the wrist and thumb. The primary origin site is the lateral epicondyle of the humerus and proximal forearm. As the extensor tendons travel from proximal to distal, they form an arrangement that can be described as a deep group and a superficial group. The superficial group consists of extensor carpi radialis longus (ECRL) and extensor carpi radialis brevis (ECRB), the extensor digitorum communis (EDC), the extensor digiti minimi (EDM [otherwise known as extensor digiti quinti (EDC)]), and the extensor carpi ulnaris (ECU). The deep group comprises the abductor pollicis longus (APL), the extensor pollicis longus (EPL), the extensor pollicis brevis (EPB), and the extensor indicis proprius (EIP). Also coursing along with the tendons in the deep compartment is the deep branch of the radial nerve, which is otherwise referred to as the posterior interosseous nerve (PIN). It provides innervation to all the aforementioned extensor tendons. See the table below for a complete extensor tendon list. As the extensor tendons cross the wrist, they course under the extensor retinaculum. The extensor retinaculum prevents the tendons from dorsal displacement caused by natural tendency to develop a straight line from tendon origin to insertion, known as bowstringing, and is divided into the tendons in 6 extensor compartments by vertical septae. See the image below. The extensor tendons of the wrist and hand are divided into 6 compartments at the dorsal wrist, each containing specific tendons. The first extensor compartment contains the EPB and the APL. The second compartment contains the radial wrist extensors, the ECRL and ECRB. The third compartment is occupied by the EPL. The EPL is notable for the diagonal course that it takes after it deviates around the dorsal radius bony protrusion called the Lister tubercle. The EIP and the 4 EDC tendons make up the fourth compartment. The fifth compartment holds the EDM tendon, and the sixth compartment holds the ECU. The tendons travel distally past the extensor retinaculum to their insertion sites. The ERCL inserts on the dorsal base of the index metacarpal. The ECRB inserts on the dorsal base of the long finger metacarpal, as it is the most central extensor tendon. This fact is important to note when tendons are selected for tendon transfer. The ERCB should not be used for a transfer donor tendon, if possible, because the resultant wrist extension will deviate to the radial or ulnar side because of the laterality of the remaining tendons. All the extensor tendons to the hand are extrinsic, that is, no tendons that extend the digits originate in the hand. As the digital extensors travel over the hand, dorsum extensor juncturae tendineae are formed to cause interconnections between tendons. These interconnections are important to understand when evaluating extensor injuries. Juncturae tendineae can cause a misdiagnosis of an extensor tendon laceration because they can aid continual extension of a digit whose tendon was cut proximal to the juncturae. See the image below. 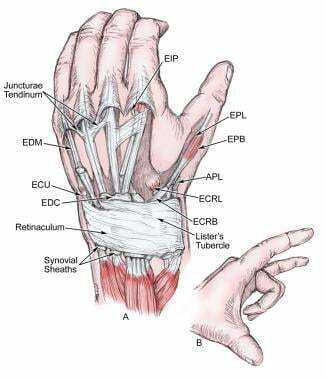 The extensor apparatus of the fingers is called an apparatus or system because of the complex interplay between the multiple extensor tendons, the intrinsic muscle system, and the many interconnecting ligaments between the tendons and the volar plates. The extensor apparatus of the digits begins just proximal to the MP joints. See the image below. Depiction of sagittal bands, lateral bands, and the relationship of the ligamentous structures. MP joint extension is accomplished by the contraction of the finger extensor tendons and its attachment to the proximal phalanx via sagittal band fibers. The sagittal band acts both as a static tether to prevent radial or ulnar displacement of the extensor tendon and as a dynamic tether that allows proximal and distal gliding of the extensors tendons during flexion and extension. Complete laceration of the sagittal bands on either side can cause instability in the extensor tendon position as it travels across the MP joint. Laceration to the radial side of the sagittal band causes far more instability than injury ulnar side. Complete laceration of one side of the sagittal band causes a subluxation of the extensor tendon to the opposite side of the laceration when the MP joint is flexed. When the MP joint is extended and tension is removed from the EDC, the tendon snaps back into the central position. The extensor apparatus becomes a complex interplay of intrinsic muscle contribution as it travels from the MP joint distally. 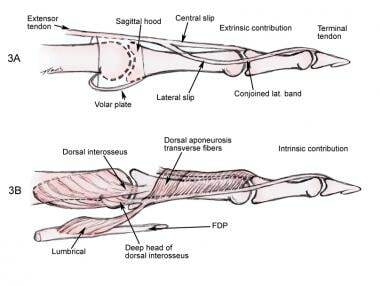 Three intrinsic sets of muscles (volar interossei, dorsal interossei, and lumbricals) contribute dynamic function to the extensor system through the lateral slips. See the image below. Both the intrinsic muscle and the extensor digitorum communis (EDC) tendon dynamically contribute to the extensor system of the digits. The tendons of the interossei muscles split in two; the superficial slip inserts on the proximal phalanx (causing MP flexion), and the deep tendon becomes part of the lateral slip. 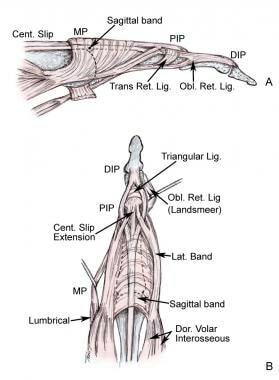 Interossei muscles contribute to the lateral slip on both sides of the finger while the lumbrical tendons only join the lateral slip on the radial side. In discussion the extensor mechanism, some confusion often arises in the terminology of lateral slips and lateral bands. The lateral slip is the tendon by which the intrinsic muscle contributes (as just previously discussed) to the extensor mechanism. 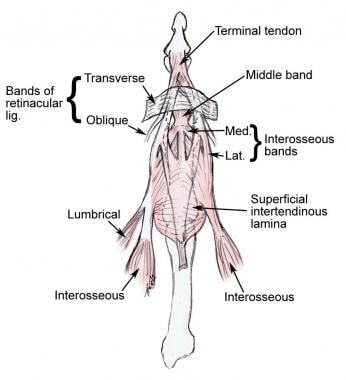 The lateral band is the extrinsic contribution (EDC tendon) to the extensor mechanism. The lateral slip and lateral band join together distal to the central slip insertion to make up a conjoined lateral band. The lateral slip gives tendon attachments to the central slip and terminal tendon to help extend the proximal interphalangeal (PIP) and distal interphalangeal (DIP) joints. Likewise, the EDC tendon provides the major portion of the central slip. It splits into 2 tendinous branches on either side of the central slip, which join with the lateral slip to make the conjoined lateral band. Finally, both sides merge to form the terminal tendon, which inserts on the dorsal aspect of the distal phalanx and extends the DIP. Between, around, and over this extensor system array are ligaments and fascial constructs (also called the reticular system), which aid the function and interplay of the extensor tendons. See the image below. The principal components of the retinacular system are the transverse and oblique ligaments (eg, Landsmeer ligament). The transverse fibers originate from the flexor sheath and proximal phalanx on the volar aspect, pass through a window in the Cleland ligament, and insert into the lateral bands and triangular ligament dorsal to the axis of proximal interphalangeal joint rotation. The deeper and more tendinous oblique retinacular ligament arises from the volar proximal interphalangeal joint capsule and proximal two thirds of the middle phalanx and inserts distally into the conjoined tendon (conjoined lateral band). Distal to the proximal interphalangeal joint, the lateral bands first are separated by a triangular ligament and then fuse to form a conjoined tendon, which inserts into the base of the distal phalanx. The extensor hood is free to slide proximally with MP extension and distally with MP flexion. With the hood in the distal position, the interossei contribute to MP flexion through their vertical fibers, with little effect on the interphalangeal joints. With the hood in the proximal position and the MP joints fixed in extension, the interossei, through the oblique fibers of the lateral bands, are able to extend the interphalangeal joints. Conversely, the lumbrical muscles are effective IP extensors irrespective of the degree of MP flexion. Similar to the interossei, they provide flexion of the MP joint via their vertical fibers. The lateral bands normally lie dorsal to the axis of motion of the extended PIP joint and shift volarward with PIP flexion. The triangular ligament prevents the lateral bands from shifting volar to the axis of motion to become flexors of the PIP joint. The primary function of the EDC is MP function, but with full MP extension or MP extension blocked, the EDC can extend the IP joints. The EPL traverses the third dorsal compartment of the wrist. It adducts and supinates the first ray and extends the MP and IP joints. The extensor pollicis brevis and abductor pollicis longus are important stabilizers of the first metacarpal base. The extensor pollicis brevis extends the carpometacarpal and MP joints, inserting into the base of the proximal phalanx. It occasionally inserts into the distal phalanx, as well. The anatomy of the thumb MP joint resembles the PIP joint anatomy of the digits. The adductor and abductor pollicis longus tendons contribute to a dorsal expansion, which has transverse fibers acting like the retinacular system to stabilize the tendons of extensor pollicis brevis and extensor pollicis longus. The intrinsics are able to extend (but not hyperextend) the IP joint through fibrous interconnections in the dorsal expansion. Lattanze LL, Lam J. Extensor tendon injuries. Trumble TE, Budoff JE. Hand Surgery Update IV. Rosemont: American Society for Surgery of the Hand; 2007. Dwyer CL, Ramirez RN, Lubahn JD. A brief review of extensor tendon injuries specific to the pediatric patient. Hand (N Y). 2015 Mar. 10 (1):23-7. [Medline]. [Full Text]. Jeon BJ, Lee JI, Roh SY, Kim JS, Lee DC, Lee KJ. Analysis of 344 Hand Injuries in a Pediatric Population. Arch Plast Surg. 2016 Jan. 43 (1):71-6. [Medline]. [Full Text]. Binstead JT, Gossman WG. Boutonniere Deformity. 2018 Jan. [Medline]. [Full Text]. Kleinert HE, Spokevicius S, Papas NH. History of flexor tendon repair. J Hand Surg Am. 1995 May. 20(3 Pt 2):S46-52. [Medline]. Naito K, Sugiyama Y, Dilokhuttakarn T, et al. A survey of extensor pollicis longus tendon injury at the time of distal radius fractures. Injury. 2017 Apr. 48 (4):925-9. [Medline]. Baratz ME, Schmidt CC, Hughes TB. Extensor tendon injuries. Green DP, Hotchkiss RN, Pederson WC, Wolfe SW. Green's Operative Hand Surgery. 5th ed. Philadelphia, Pa: Elsevier; 2006. Vol 1: 187-218. Herndon JH. Tendon injuries--extensor surface. Emerg Med Clin North Am. 1985 May. 3(2):333-40. [Medline]. Al-Qattan MM. Conservative management of partial extensor tendon lacerations greater than half the width of the tendon in manual workers. Ann Plast Surg. 2015 Apr. 74 (4):408-9. [Medline]. Rockwell WB, Butler PN, Byrne BA. Extensor tendon: anatomy, injury, and reconstruction. Plast Reconstr Surg. 2000 Dec. 106(7):1592-603; quiz 1604, 1673. [Medline]. Colzani G, Tos P, Battiston B, Merolla G, Porcellini G, Artiaco S. Traumatic Extensor Tendon Injuries to the Hand: Clinical Anatomy, Biomechanics, and Surgical Procedure Review. J Hand Microsurg. 2016 Apr. 8 (1):2-12. [Medline]. [Full Text]. Doyle JR, Botte MJ. Surgical Anatomy of the Hand and Upper Extremity. Philadelphia, Pa: Lippincott Williams & Wilkins; 2003.
von Schroeder HP, Botte MJ. Anatomy of the extensor tendons of the fingers: variations and multiplicity. J Hand Surg Am. 1995 Jan. 20(1):27-34. [Medline]. Young CM, Rayan GM. The sagittal band: anatomic and biomechanical study. J Hand Surg Am. 2000 Nov. 25(6):1107-13. [Medline]. Dezfuli B, Taljanovic MS, Melville DM, Krupinski EA, Sheppard JE. Accuracy of High-Resolution Ultrasonography in the Detection of Extensor Tendon Lacerations. Ann Plast Surg. 2016 Feb. 76 (2):187-92. [Medline]. Wu TS, Roque PJ, Green J, Drachman D, Khor KN, Rosenberg M, et al. Bedside ultrasound evaluation of tendon injuries. Am J Emerg Med. 2012 Jan 11. [Medline]. Swen WA, Jacobs JW, Hubach PC, Klasens JH, Algra PR, Bijlsma JW. Comparison of sonography and magnetic resonance imaging for the diagnosis of partial tears of finger extensor tendons in rheumatoid arthritis. Rheumatology (Oxford). 2000 Jan. 39(1):55-62. [Medline]. Sakuma Y, Ochi K, Iwamoto T, et al. Number of ruptured tendons and surgical delay as prognostic factors for the surgical repair of extensor tendon ruptures in the rheumatoid wrist. J Rheumatol. 2014 Feb. 41(2):265-9. [Medline]. Brzezienski MA, Schneider LH. Extensor tendon injuries at the distal interphalangeal joint. Hand Clin. 1995 Aug. 11(3):373-86. [Medline]. Izadpanah A, Izadpanah A, Sinno H, Williams B. Pediatric boutonniere deformity after blunt closed traumatic injury. Pediatr Emerg Care. 2011 Nov. 27(11):1069-71. [Medline]. Froehlich JA, Akelman E, Herndon JH. Extensor tendon injuries at the proximal interphalangeal joint. Hand Clin. 1988 Feb. 4(1):25-37. [Medline]. Hall B, Lee H, Page R, Rosenwax L, Lee AH. Comparing three postoperative treatment protocols for extensor tendon repair in zones V and VI of the hand. Am J Occup Ther. 2010 Sep-Oct. 64(5):682-8. [Medline]. Namazi H, Mozaffarian K, Golmakani MR. Comparison of Roll Stitch Technique and Core Suture Technique for Extensor Tendon Repair at the Metacarpophalangeal Joint level. Trauma Mon. 2016 Feb. 21 (1):e24563. [Medline]. [Full Text]. Gelb RI. Tendon transfer for rupture of the extensor pollicis longus. Hand Clin. 1995 Aug. 11(3):411-22. [Medline]. Pechlaner S, Hussl H, Kerschbaumer F. Atlas of Hand Surgery. 2nd ed. Stuttgart: Thieme; 2000. 565. Woo SH, Tsai TM, Kleinert HE, Chew WY, Voor MJ. A biomechanical comparison of four extensor tendon repair techniques in zone IV. Plast Reconstr Surg. 2005 May. 115(6):1674-81; discussion 1682-3. [Medline]. Newport ML, Williams CD. Biomechanical characteristics of extensor tendon suture techniques. J Hand Surg [Am]. 1992 Nov. 17(6):1117-23. [Medline]. Soni P, Stern CA, Foreman KB, Rockwell WB. Advances in extensor tendon diagnosis and therapy. Plast Reconstr Surg. 2009 Feb. 123(2):727-8. [Medline]. Sharma JV, Liang NJ, Owen JR, Wayne JS, Isaacs JE. Analysis of relative motion splint in the treatment of zone VI extensor tendon injuries. J Hand Surg Am. 2006 Sep. 31(7):1118-22. [Medline]. Mowlavi A, Burns M, Brown RE. Dynamic versus static splinting of simple zone V and zone VI extensor tendon repairs: a prospective, randomized, controlled study. Plast Reconstr Surg. 2005 Feb. 115(2):482-7. [Medline]. Russell RC, Jones M, Grobbelaar A. Extensor tendon repair: mobilise or splint?. Chir Main. 2003 Feb. 22(1):19-23. [Medline]. Howell JW, Merritt WH, Robinson SJ. Immediate controlled active motion following zone 4-7 extensor tendon repair. J Hand Ther. 2005 Apr-Jun. 18(2):182-90. [Medline]. Chow JA, Dovelle S, Thomes LJ, et al. A comparison of results of extensor tendon repair followed by early controlled mobilisation versus static immobilisation. J Hand Surg [Br]. 1989 Feb. 14(1):18-20. [Medline]. Crosby CA, Wehbe MA. Early motion after extensor tendon surgery. Hand Clin. 1996 Feb. 12(1):57-64. [Medline]. Crosby CA, Wehbe MA. Early protected motion after extensor tendon repair. J Hand Surg [Am]. 1999 Sep. 24(5):1061-70. [Medline]. Evans RB. Immediate active short arc motion following extensor tendon repair. Hand Clin. 1995 Aug. 11(3):483-512. [Medline]. Svens B, Ames E, Burford K, Caplash Y. Relative active motion programs following extensor tendon repair: A pilot study using a prospective cohort and evaluating outcomes following orthotic interventions. J Hand Ther. 2015 Jan-Mar. 28 (1):11-8; quiz 19. [Medline]. Ip WY, Chow SP. Results of dynamic splintage following extensor tendon repair. J Hand Surg [Br]. 1997 Apr. 22(2):283-7. [Medline]. Sylaidis P, Youatt M, Logan A. Early active mobilization for extensor tendon injuries. The Norwich regime. J Hand Surg [Br]. 1997 Oct. 22(5):594-6. [Medline]. Bruner S, Wittemann M, Jester A, Blumenthal K, Germann G. Dynamic splinting after extensor tendon repair in zones V to VII. J Hand Surg Br. 2003 Jun. 28(3):224-7. [Medline]. Carl HD, Forst R, Schaller P. Results of primary extensor tendon repair in relation to the zone of injury and pre-operative outcome estimation. Arch Orthop Trauma Surg. 2007 Feb. 127(2):115-9. [Medline]. Purcell T, Eadie PA, Murugan S, et al. Static splinting of extensor tendon repairs. J Hand Surg [Br]. 2000 Apr. 25(2):180-2. [Medline]. Collocott SJ, Kelly E, Ellis RF. Optimal early active mobilisation protocol after extensor tendon repairs in zones V and VI: A systematic review of literature. Hand Ther. 2018 Mar. 23 (1):3-18. [Medline]. [Full Text]. Regions of the dorsum of the hand have been divided up into extensor zones to further describe the location of an extensor tendon laceration. Defining a laceration per zone area enables better communication and relates to the complexity of the needed repair. Primary closure of thumb extensor tendon laceration with the figure-of-8 technique. Kirchmayr tendon laceration repair suture technique. Four common core and epitenon tendon repair suture techniques. The authors and editors of Medscape Reference gratefully acknowledge the contributions of previous author, D Glynn Bolitho, MD, PhD, FACS, FRCSC, FCS(SA), to the development and writing of this article. Is Halloween Dangerous for Adults? Self Assessment Fast Five Quiz: Are You Prepared to Confront Holiday Decorating Injuries?